Fortunately for students of cut glass, Lady Grisell Baillie “a Scottish lady with a keen provincial eye for London fashion” (note 1), had the habit of noticing the table equipment that was used at the parties she attended early in the eighteenth century. 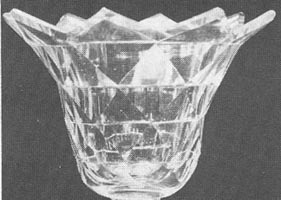 Thus, in 1727 she confided to her diary that at the center of Lord Mountjoy’s table there was “a scalloped glass [with] cornered brims.” This glass was probably similar to the one, above on the left, a sweetmeat glass, shown in close-up, that has also been described as having an “arch-and-point” rim and is dated c1720 (Hughes 1956, pp. 292, 304). 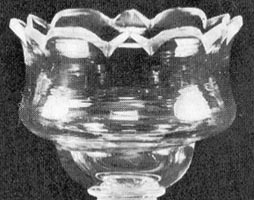 The glass’ bowl has the profile of a double ogee and is uncut. The image on the right also shows a sweetmeat’s bowl in close-up (Charleston 1984, pl. 48e). It has a rather startling “brim” that is entirely “cornered,” the likes of which was probably not seen again until C. Dorflinger & Sons produced its Star of Bethlehem pattern on a candlestick (Feller 1988, pp. 211, 278)! The glass’s bowl has a simple ogee profile and is cut in rows of flat triangles. It is dated c1730. Lady Grisell Baillie’s diary is important today because it helps date the beginning of the cut-glass industry in England, after the death of Queen Anne and the arrival of the first of the Georges (1714) when commerce with Germany increased and the immigration of German workers, including glass cutters, became more common in the new political climate. The German cutters, coming from central Europe where glass cutting has been described as “indigenous,” taught their craft to the English workmen. Earlier English cut glass was limited, for the most part, to grinding — the use of horizontally mounted wheels to grind, bevel, and polish mirrors. Although the scalloped rim was more popular than the cornered rim during the decades that followed, the latter style was never completely forgotten. The collector can find scalloped-and-cornered rims on many articles from both the middle and the brilliant periods of cut glass. Examples from the former period have been discussed by Crawford in relation to products produced by the Boston and Sandwich Glass Company (note 2). He describes these rims as being made up of scallops and “points,” in sequences such as [VUVU] and [VUUVUU]. They are sometimes seen on compotes with regular or with turned-over rims. Had Crawford had access to the Val St. Lambert composite catalog, he undoubtedly would have included this Belgian manufacturer in his discussion. For example, our Val Saint Lambert compote has a [VUVU] rim. For brilliant-period examples, one can frequently find scalloped-and-cornered rims on articles cut in the Russian pattern,, and there are many other examples. One of the earliest is found on the illustration that accompanies the patented pattern of 1882 that is known today as the “MacDonald” pattern (pat. no. 12,982). The following rim — [VUVU] again — is taken from a spoon holder (spooner) that was probably made during the period of transition between the middle and brilliant periods of American cut glass. 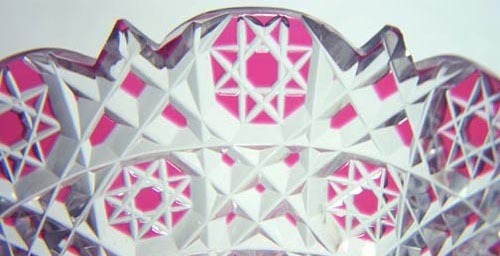 It is cut in a cane-based pattern, red cut-to-clear. Because this item is of particular interest, additional views of it can be found in the Cane file. 1. An in-depth account of the early cut-glass industry in England can be found in Charleston (1984). This and the following quotation are taken from this source: p. 169 and p. 177, respectively. 2. [Crawford, T. A. ], 1990: The Sandwich cut hexagonal foot, Pittsburgh Glass Journal, Vol. 3, No. 4, pp. 2-3 (Dec).